The phrase ‘5 Kilometers’ for most marathoners and ultra marathoners is commonly used to describe how far they have left in a race. Rarely does it describe the entirety of the event they plan to race. But you should consider the big benefits you can reap from racing short distance races, even if your ambitions have you going long this fall. 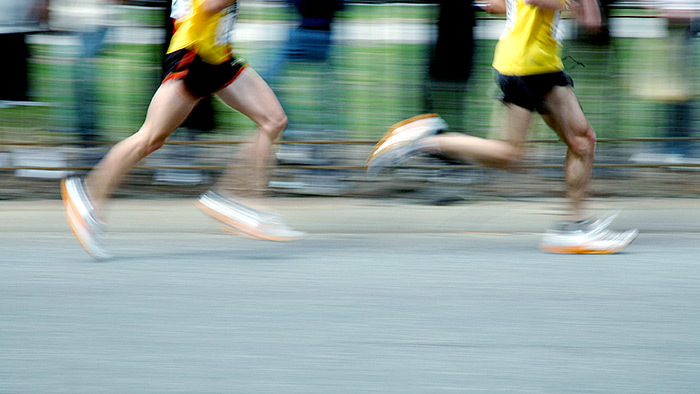 Training for short distance races has big benefits for your aerobic capacity. Most endurance athletes are rockstars at low to moderate intensity exercise. However when you tap into high end work you can see big results in a relatively short amount of time. Consider that training for a 5km-10km race will require you to do structured speed work, and in the process, develop your body to utilize more oxygen (aerobic capacity). The more oxygen that can be consumed, the more physical work you’ll be able to do. Short distance running and the training it requires can improve the flow of oxygenated blood to muscle tissue, and in turn can improve mitochondrial density. Mitochondria are muscle cells that help produce Adenosine Triphosphate (ATP), which is the actual fuel that supplies muscle contractions. If you improve a muscle’s ability to use oxygen for shorter distances – you can see big benefits for a long race. Think of this as a major physiological benefit of short distance training for long distance runners. Long distance runners fear that if they exchange some long slow running for a few short days – they’ll lose the ability to be strong over time. You might consider that athletes who train for a mix of events tend to have better running economy, and ultimately have the ability to change gears and tackle technical sections in longer races. Integrating speed work into your training cycle and preparing for a 5K or 10k race increases your efficiency, and can increase your baseline aerobic running pace. Adding in high aerobic workouts in preparation for a short distance race should be integrated with caution, and with a goal of building your time at a high heart rate over time. Keep to the 10% rule for new runners who are integrating this into their training regimen. If you did 12:00 of high intensity continuous work in week 2, you should complete 13.5 up to 15 minutes of work in the following week. High aerobic work requires a significant amount of energy to complete so if you’re looking to keep a mileage number you might want to pad your work with warm up and cool down miles or utilize a second run on the day of a focused session at a very low heart rate to help flush out any waste produced from your high aerobic session. Training for and racing 5km and 10km races and taking time to integrate the training into your build up for a long distance race will absolutely provide a benefit. It will help you not only increase your baseline running pace, but will help direct the rest of your long distance racing for your season. These types of events can fit anywhere in your training if there is a goal and intent to the training or race. You may find a big benefit in doing this work early and using these races as building blocks early on, or even using them to test your fitness acumen in later stages of sharpening for a half, full, or ultra.